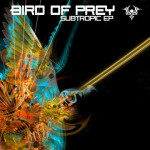 Cyberset is proud to announce the release of the SubTropic EP by Bird Of Prey. Fusing Dubstep, Drum & Bass, Progressive and Trance influences, Bird Of Prey makes forays into new and exciting territories, taking quality bits from each of his influences and fusing them into a cohesive new sound. Bird of Prey is the project of San Francisco bay area native Torin Goodnight. Creating electronic music for close to a decade, he has developed a unique take on various influences. His music is an attempt to hybridize various genres, fusing the swirling sensibilities of psychedelic sound with hard hitting dub and breaks vibes. Combining aggressive basslines, twisted leads, and colorful atmospheres to create a diverse and immersive soundscape. His recent success on Vapor Vent Recordings, many licensed tracks to compilations, and now an EP on Cyberset Music has put this artist on the map. Already he is being compared in diversity and freshness to the emergence of early Shpongle and groundshaking evolutions in “Psychedelic chillout music”. Bird Of Prey has quite a few surprises yet to drop on our unsuspecting selves.